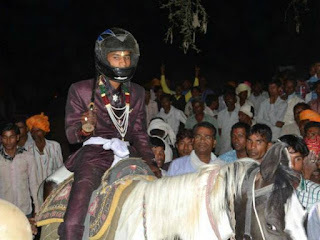 A Dalit groom had to wear a helmet during his marriage procession at Negrun in the district as upper caste people in the village threw stones at him for riding a horse. They then took away the animal. At least five persons, including an Additional Tahsildar, K.L. Jain, were injured in the attack in the night of May 10, Suresh Balraj, who is in charge of the Taal police station, said on Tuesday. The police have registered a case against 72 people under sections of the Indian Penal Code and the Scheduled Castes and Scheduled Tribes (Prevention of Atrocities) Act, 1989. A case of arson was registered against four others. The bride’s father, Puralal, said the upper caste people in the village had opposed the idea of the groom, Pavan, riding a horse and took away the animal. “Sensing trouble, I had informed the police in advance following which SDOP and SDM reached the village along with some force to ensure that the marriage procession passed through without trouble,” he said. After one horse was taken away, another was arranged by the family, and in the presence of policemen, the procession was taken out with the groom riding the horse. However, the stone-throwing started again. The police then arranged a helmet and asked the groom to wear it as a precautionary measure, following which the procession passed through Negrun streets, Mr. Balraj said. After the marriage ceremony with the bride leaving with the groom, Mr. Puralal reached the Taal police station and filed a complaint. A case was registered against Shravan Singh and 71 others. Twenty-seven people have already been arrested by the Deputy Superintendent of Police at the Scheduled Caste and Scheduled Tribe police station, Rasheed Khan. During the protest, a few persons set fire to the premises of one Prabhulal, following which four were arrested. The police have started an investigation.